← Mother’s Day Celebration at City Buffet Restaurant! Have You Tried Taho Boy? I miss hot taho (soy bean curd) in the mornings. When we were young, we lived in a place in Makati where an elderly taho vendor passes by our house every morning to deliver his hot, sweet and delicious taho to the kids and adults who eagerly await his coming. Back then, a small plastic cup of taho with small tapioca pearls cost only Php5.00. I miss those days! Now that we’re living in a commercial area, the chances of seeing a taho vendor near our place is very dim. 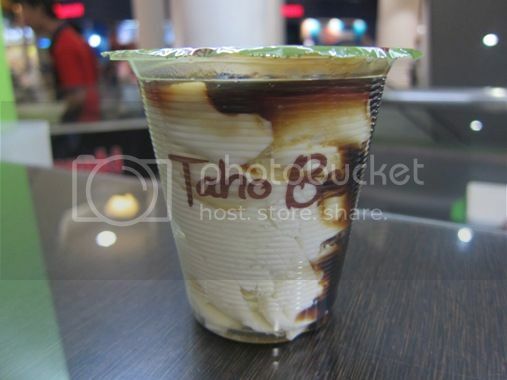 So imagine my happiness when I spotted Taho Boy at the food court of Robinsons Galleria one day. 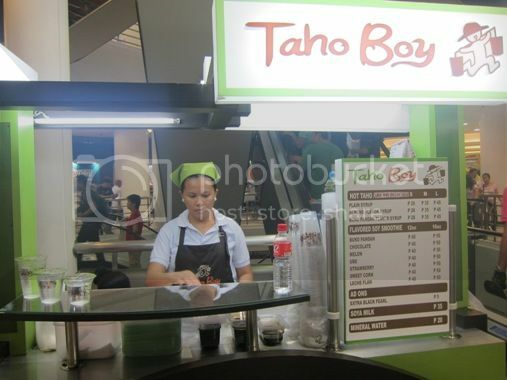 Taho Boy is a food stall selling hot and cold taho, flavored soy smoothie and soya milk. You can have your hot taho in plain syrup, almond flavor syrup or buko pandan flavor syrup. I have tried both buko pandan and almond flavor syrups. I like the buko pandan flavor syrup better; the almond flavor syrup tasted like medicine. Next time, I’ll try the plain syrup. You can also order extra black pearls for only Php5.00. Now if I’m craving for hot taho, all I need to do is go to Taho Boy at Robinsons Galleria, which by the way, is just walking distance from our place. This entry was posted in Robinsons Galleria, Taho, Taho Boy. Bookmark the permalink. 2 Responses to Have You Tried Taho Boy? i suddenly craved for taho! i haven’t tried it but I usually buy from Taho de Manila (coz that’s a stall which i often see in the mall near us) =) i prefer my taho chilled most of the time.. haha then konti lang syrup pero lots of sago!